My latest trip to Tree House Brewing has resulted in one of my favorites. 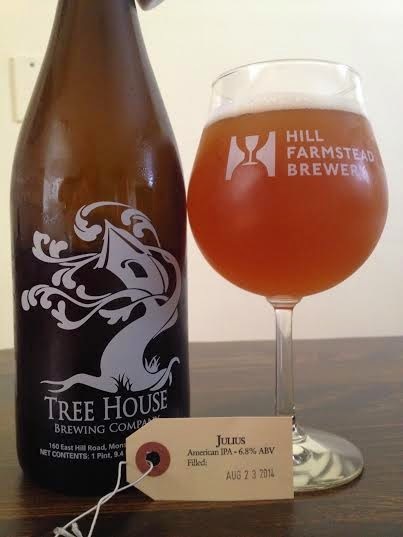 Julius is Tree House's flagship beer clocking in at 6.80% and brewed with 1.6oz per gallon of American hops. Pours a beautiful, hazy orange with a finger's worth of head. I can't see a thing through this no matter the light source. Every Tree House IPA is bursting with tropical fruits and this is no exception. Huge orange juice and mango up front, but that's not the only big thing on the aroma as a massive hop presence works off the juicy notes perfectly. This is such a balanced IPA. Those huge, citrus flavors pop right at the front of the tongue. Immediately after I am slammed with a delicious hop bitterness. The bitter flavors aren't too aggressive and they work to accent the juiciness. Julius gives you a practically perfect balance of juice and hops that doesn't come around often. This makes for an incredibly drinkable beer that goes down smooth and leaves a clean aftertaste. Worthy of its praise in all aspects, Tree House Julius is well-worth it's weight in gold. With it's blend of hops and fruity flavors, Julius is heavily sought out and I can see why people travel from all over the state (and beyond) just to get a taste.